The secret to turning gummy worms into Frankenworms is the baking soda and vinegar chemical reaction. 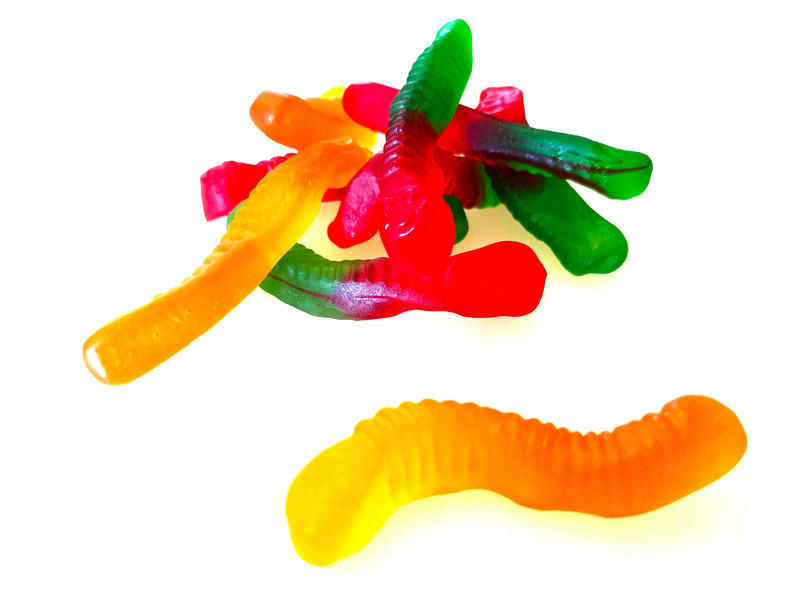 Frankenworms are gummy worm candies that seem to move with a zombie life of their own. Making the worms dance is a fun science experiment, perfect for Halloween. The project uses candy, baking soda, and vinegar, so it’s safe enough for young children. There’s nothing magical about gummy worms except their long shape. You can try animating licorice or other long, skinny candies. Gel-type candies work best because they absorb the baking soda faster. Gummy worms are too heavy to wriggle well, so you need to make them lighter. Cut each worm into halves or quarters lengthwise to make skinny gummy worms. Place the cut worms into a glass. Pour a few spoonfuls of baking soda over the worms. Add just enough water to dissolve most of the baking soda. The goal is to make a saturated solution, so if all of the baking soda dissolves in the water, add more. Set the worms aside to soak in the baking soda solution for 15-30 minutes. Pour vinegar into a glass. Drop the soaked worms into the glass. Initially, nothing will happen. Bubbles will start to form on the surface of the worms as the baking soda and vinegar react. The bubbles will pull the worms toward the surface, causing them to writhe and wriggle. Eventually the reaction will end and the Frankenworms will become wet gummy worms. Revive used Frankenworms by soaking them in baking soda solution and placing them in fresh vinegar. The same reaction that makes a baking soda and vinegar volcano erupt brings gummy worms to “life”. Baking soda (sodium bicarbonate) and vinegar (dilute acetic acid) undergo a chemical reaction that produces carbon dioxide gas. The gas bubbles form on the surface of the worms. As more and more carbon dioxide molecules group together, larger bubbles form. Big bubbles are lighter than vinegar, so they make the worms rise. If bubbles become large enough to break away from the worm and rise on their own, that part of the worm sinks back down.